Yet another vignette with several more Black Hussar (née Westphalia) minis, as well a Victrix artilleryman and limber. I'm not quite sure who the guy with the caduceus staff is supposed to be, so just painted him up with a blue smock and what I think is a leather vest. 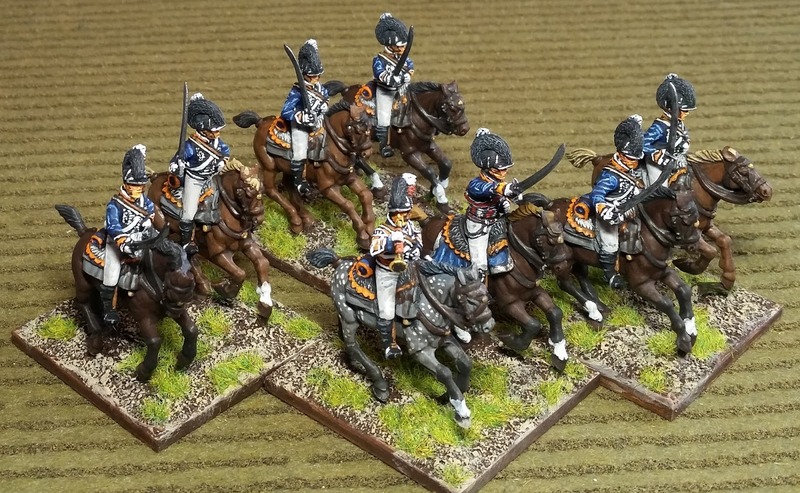 The shako, backpack and musket are Perry and Victrix plastic spare parts. The saw blade has a very nicely sculpted serrated edge. The guy holding it wears some cool looking glasses - giving him a sort of Steampunk look. 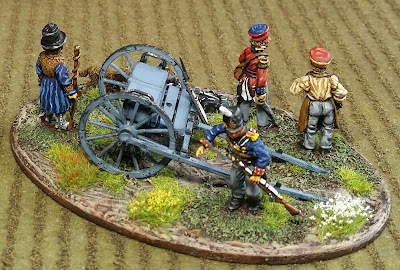 There are two more limbers from the Victrix artillery set which might be used in other vignettes. As mentioned in the previous post, the 3mm thick plywood oval base is sold by Hobby Lobby - a pack of 8 for about $2.00. Thank you very much for stopping by and best wishes to you all. 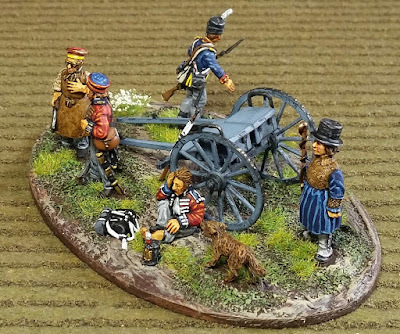 Oh, and I almost forgot to mention it, but just ordered a copy of Black Powder 2nd Edition this morning. I suppose this would've been called a "mini-diorama" in days gone by, but vignette is the norm nowadays. These are mostly some of the Black Hussar (formerly Westphalia) minis from a recent first time order from them (actually I think it's a one-man show there). 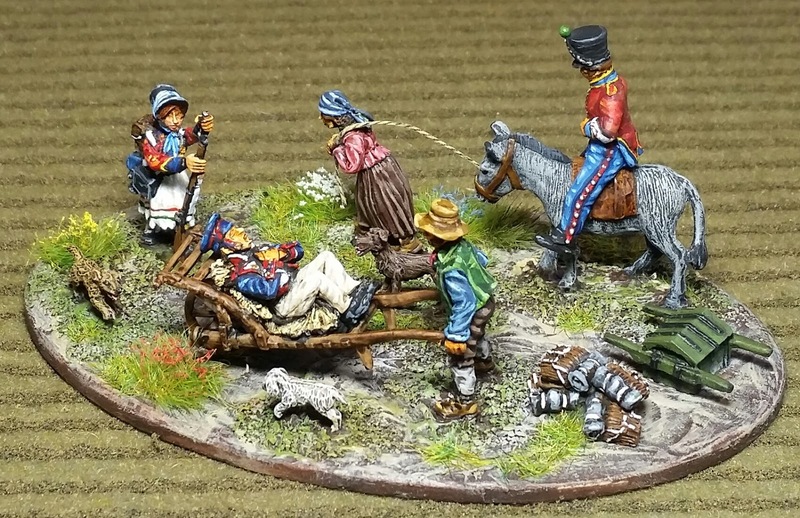 The peasant woman pulling the donkey comes with the wounded infantryman set - she's supposed to be pulling the cart. 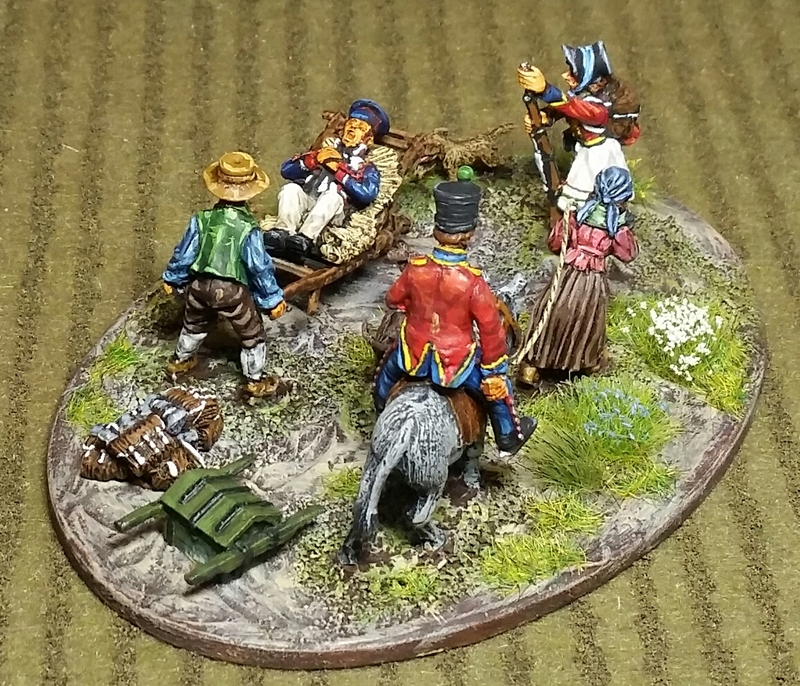 The donkey is an unknown make which was purchased from a vendor at an Enfilade convention a few years ago; the 9th Hussar atop the donkey is a left over plastic Perry figure from the Chasseur a Cheval set. 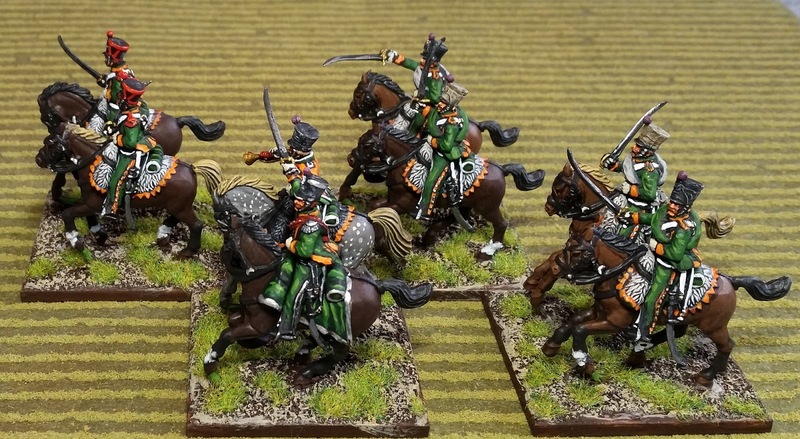 The three pooches are also Black Hussar figures, and the little white one looks just like my wife's doggie. The stack of rucks and ammo crate are from a Sash and Saber artillery set. The 3mm thick plywood oval base is from Hobby Lobby - a set of 8 for under $2 with the 40% off coupon - yes, I use coupons whenever I can. The "rope" the peasant lady is using is a length of thread which was first soaked with white glue then dry brushed. 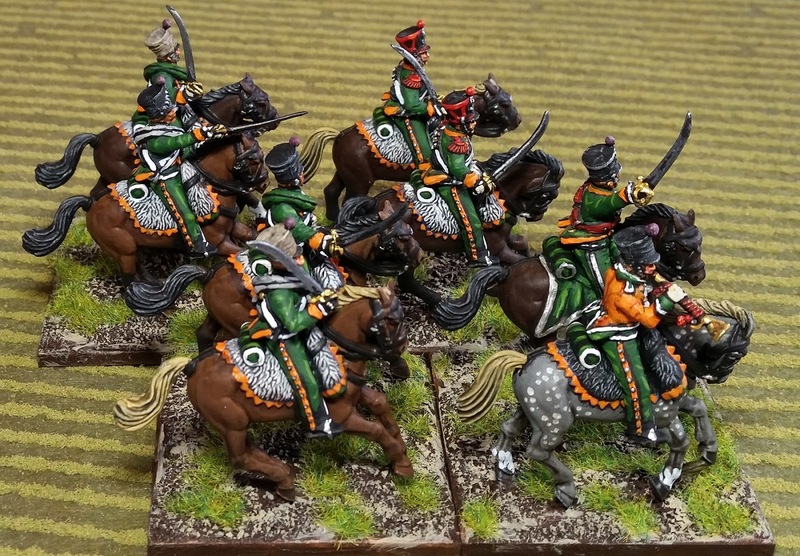 The hussar's coat tails were originally sculpted flared back as if riding at a gallop. They were snipped off and then reposition with some scalping away from the body and gaps filled with Green Stuff. 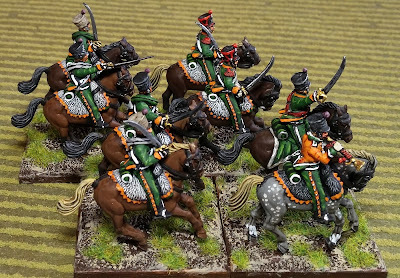 The bandage on the hussar's left arm was also molded with Green Stuff - about the extent of my sculpting abilities. 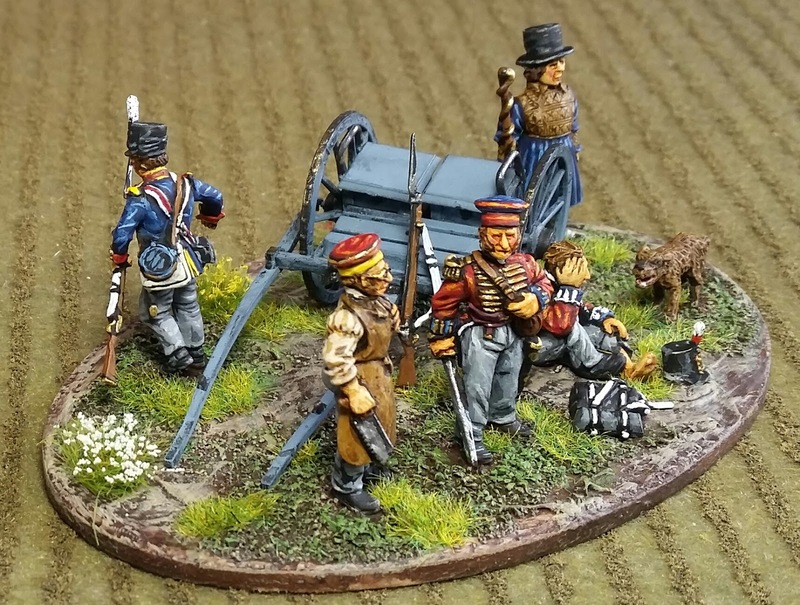 This was a nice break from the usual work on multiple figure units and the hardest part was trying to coordinate the colors of the civilian attire. Thank you all for dropping by and happy gaming and/or painting! 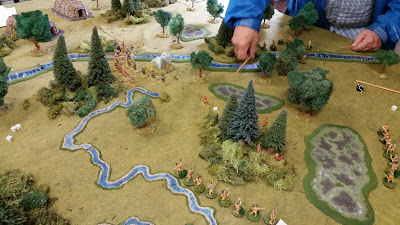 Just got back from another wonderful Fix Bayonet game day held at quaint and historic Fort Steilacoom. 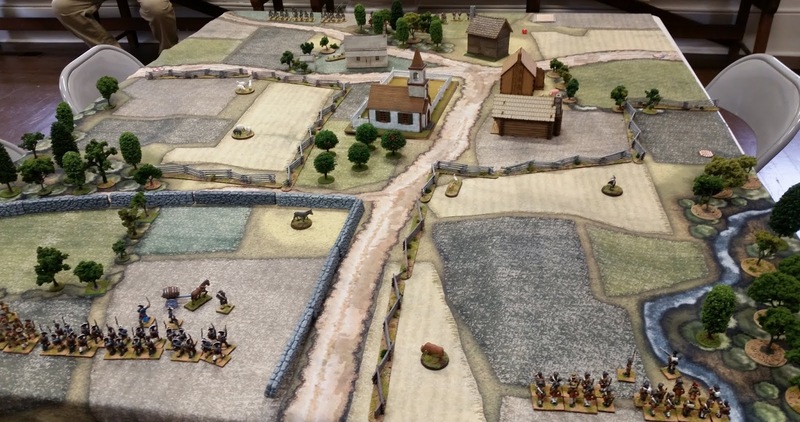 One of the local gamers is part of the historical society that supports the fort. He's been hosting this game day for several years now. In fact, when I pulled up this morning, his dad was towing away a Civil War era howitzer for a display at another event. It was great seeing folks who I hadn't seen since Enfilade in May. But, it's like I just saw them yesterday, as I've known them for about 10 years now. It was great to host a Black Powder game again - the first time since 2012 when I hosted a large Salamanca game at Enfilade. Luckily one of the players is very experienced with Black Powder and he helped clarify a lot of questions for the other five players - all of whom were either inexperienced or hadn't played the rules in a long time too. Anyway, here are some images of the games today. British right holding on to the bridge which was worth 5 victory points. 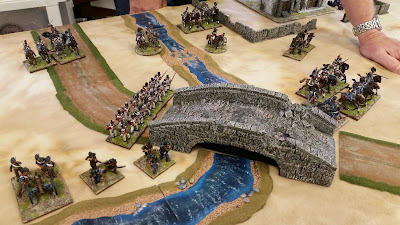 The game ended up a tie with both the French and British occupying their respective built up areas and contesting the bridge. 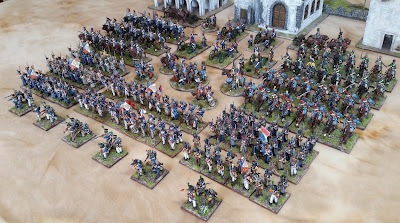 The French line from the left. 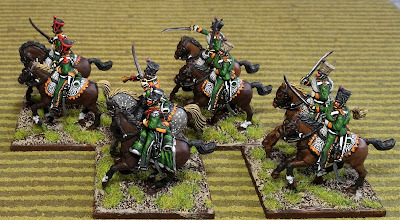 The smaller units made up of 4 cavalry and 16 foot worked well for the 6 players on a 5x6' table - along with 2/3rd's movement and ranges. 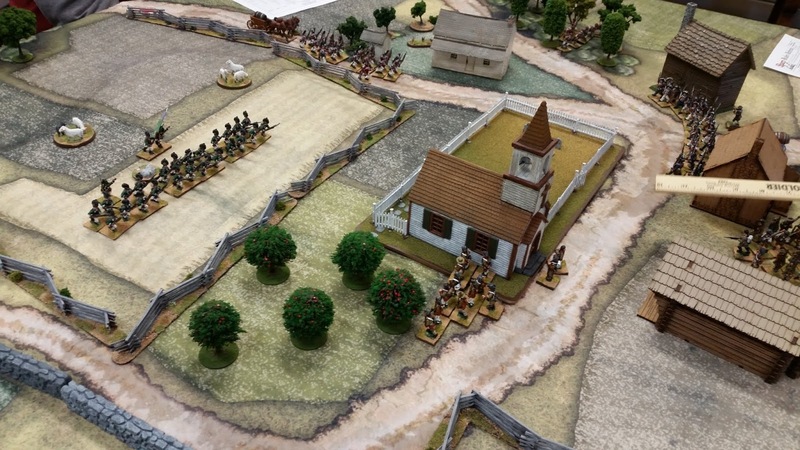 A very tasteful looking AWI Sharp Practice 2 game hosted by Mitch B. - here's his blog: West Sound Warriors. The "good guys" on Mitch's table. 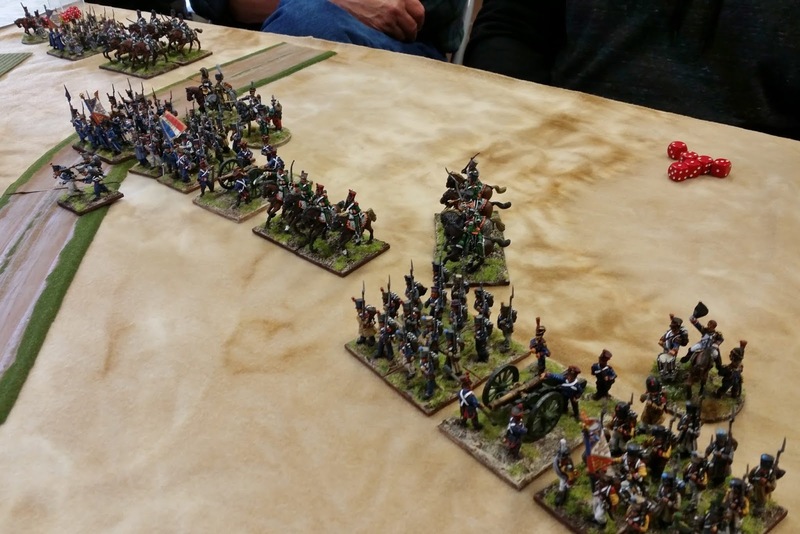 Action during the AWI SP2 game. 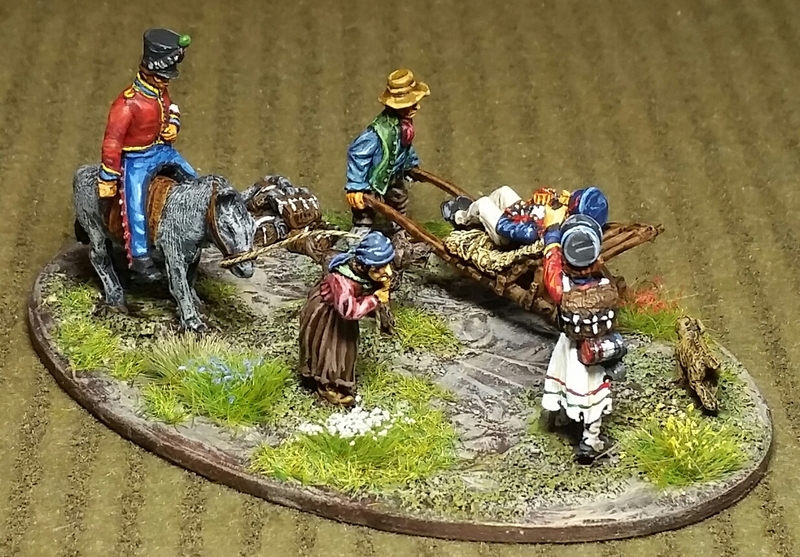 An interesting looking Song of Drums and Tomahawks game run by Kevin S. and David S. Here are their respective blogs - A Gamer's Tale and I Live With Cats. 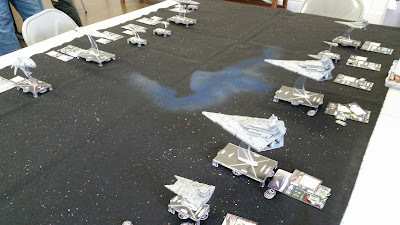 A Star Wars Armada game run by Scott M.
Great looking hand-painted 15mm armor by the host, Lawrence B. - in a What A Tanker game. And last but not least, I picked up all these nicely illustrated books for $10 from Mark W. Mark is a retired educator and brought boxes of books -many free with a $1 donation to the fort. 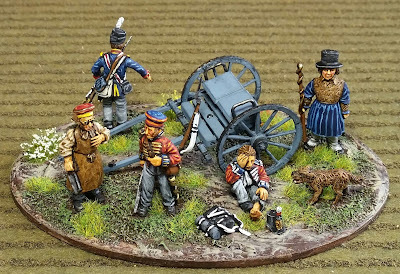 Again, it was great to see gamer buddies I don't see very often and also refreshing myself with Black Powder again. Until next time, happy gaming and/or painting! 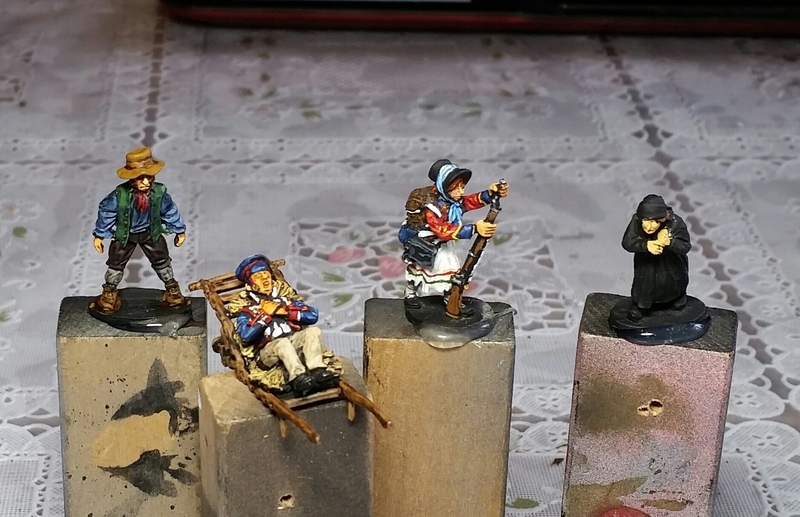 Just a quick WIP shot of a few figures I recently ordered from Black Hussar Miniatures. Very nicely sculpted and great service. It only took about two weeks to get here (Washington State) from Germany. 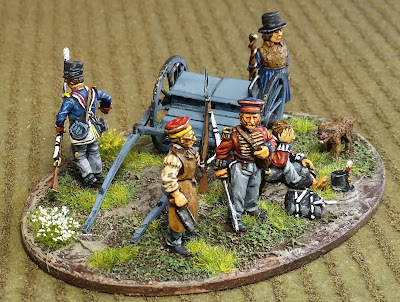 Tomorrow is the small Black Powder game I'll be hosting at the annual Fix Bayonets game day held in Quarters #2 at Fort Steilacoom. I'll be sure to post images of the game as well as the other games being hosted. Until then, best wishes to you all! 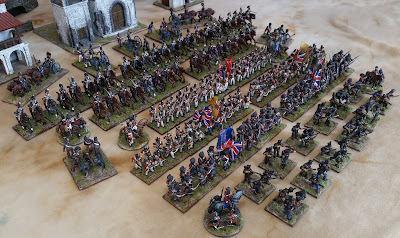 Here are the current French and British forces for Black Powder. The majority are Victrix and Perry plastics. Most of the command stand figures are metal. 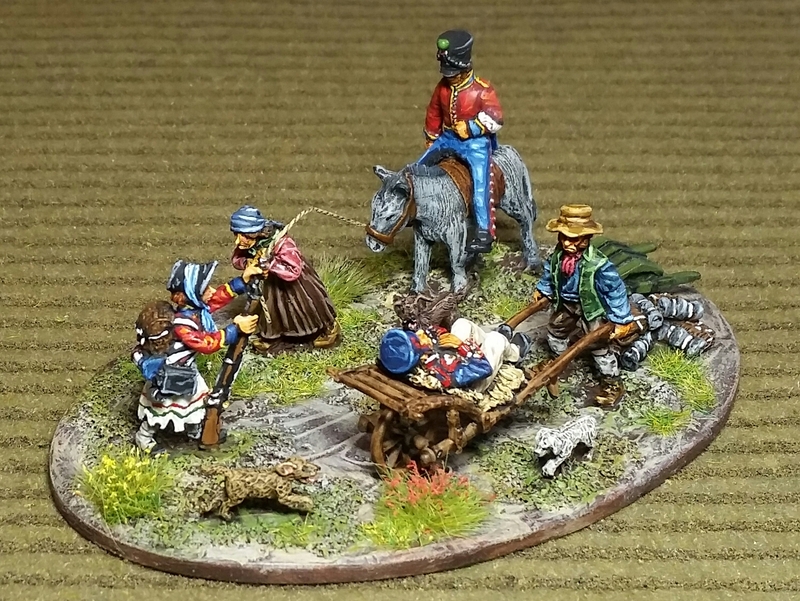 The Spanish Guerrillas are Front Rank figures. 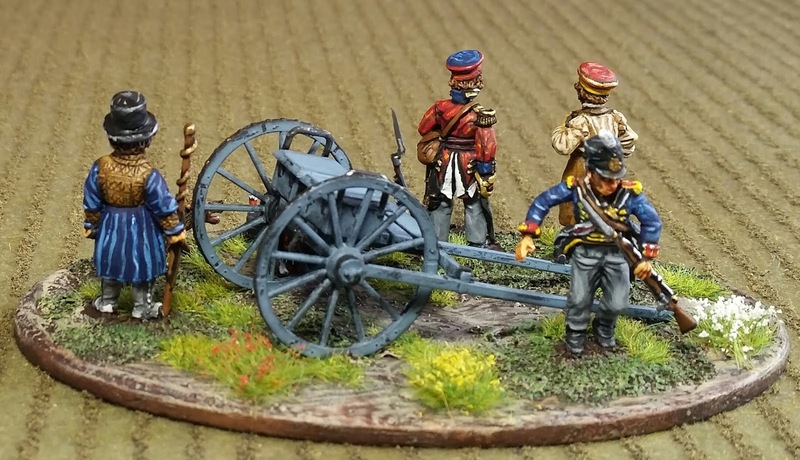 The old Foundry Napoleon and Staff set are also included. 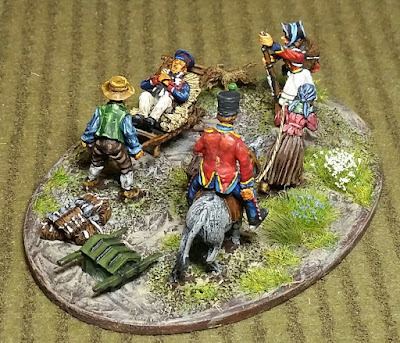 I should add a Wellington figure, but he wasn't a fancy dresser, so will settle for the dashing Hussar general for the overall commander of the British. As pictured, the French have 7 infantry units in varying sizes; and 7 cavalry unit - four light (two each, Hussars and Chasseurs), one medium (Dragoons), and two heavies (Cuirassiers and Carabiniers); five cannon - of varying sizes; there are also separately based Voltigeur skirmishers which can be used separately or in Mixed formations. The British have 2 units of Rifles (with Portuguese Cacadores included); a unit of Spanish Guerrillas; 5 infantry units consisting of two Highland units, two regular Line infantry units and a Coldstream Guards unit; 5 cavalry units: 2 units each of Hussars and Light Dragoons and a unit of Spanish Cuirassiers; and finally 5 artillery batteries - two of which are RHA. As mentioned in earlier posts, the infantry units can be broken down into 16-man formations which would increase the total number of units for more players. 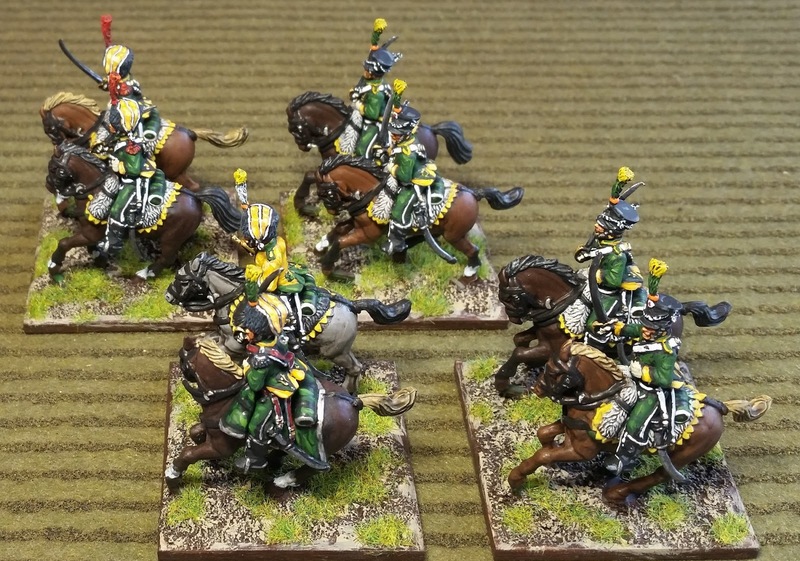 Otherwise, these can be played as is with unit size modifiers. 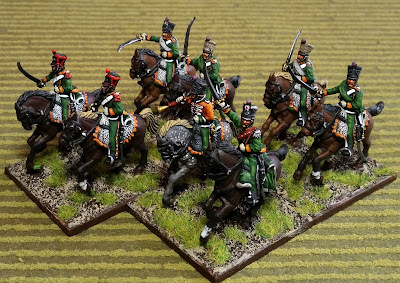 I may someday add a few more units - namely French Lancers, French Horse Artillery, British Heavy Dragoons and maybe a British 71st Light Infantry unit (with the cool checkered shako). 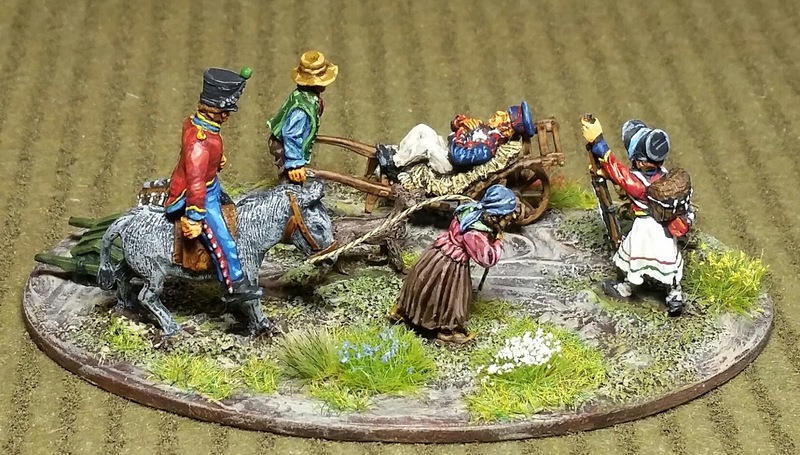 But for now, it's time to get ready for the smallish (5x6' table) Black Powder game next Saturday. I'll be using one of the scenarios in the Peninsular supplement - the author notes that most of them were played on 4x6' tables, so should work out well. Thanks for checking out the blog and hope you enjoyed the pictures. Best wishes to you all! This is the last unit from the most-recent Perry order of Napoleonic reinforcements. 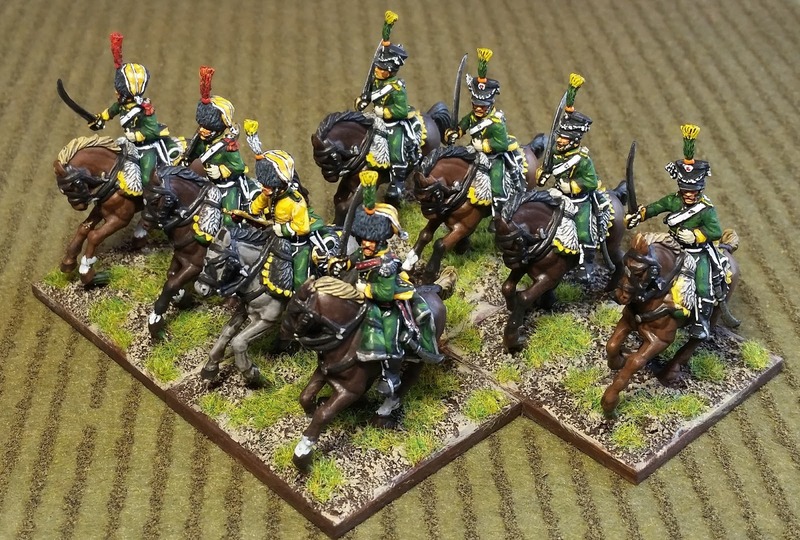 A unit of British Light Dragoons in the earlier uniform. 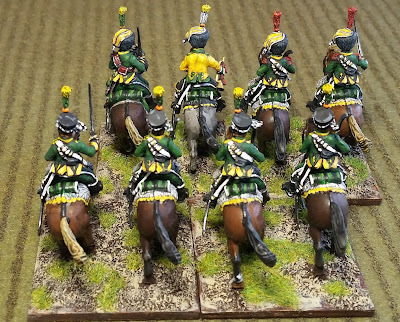 The orange facings could represent the 14th (Duchess of York's Own) or 20th Regiments. Both served extensively in the Peninsula. 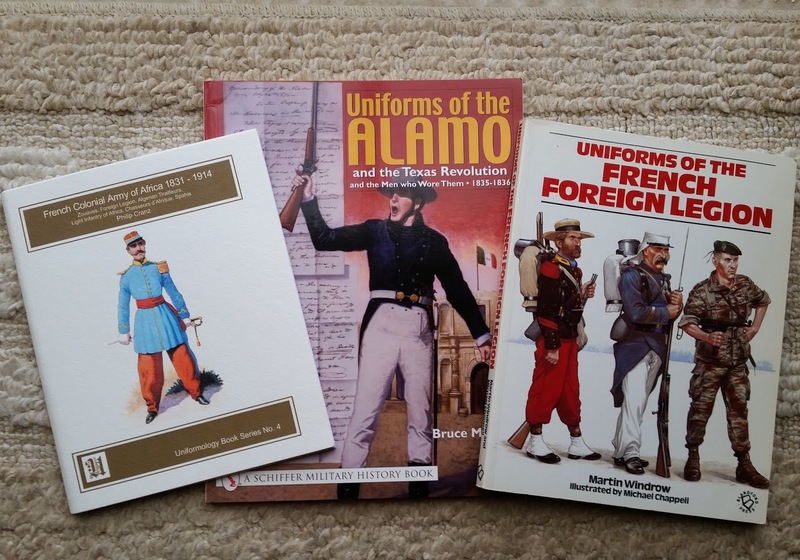 The Perry set comes with several headgear options, including the later shako which was worn at Waterloo, but I chose the more distinctively-British Tarelton helmet. 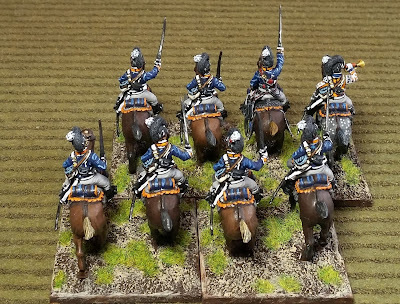 Currently, all of the cavalry for my Napoleonics are in 8-figure units. The smaller size should allow for more maneuvering on smaller tables. 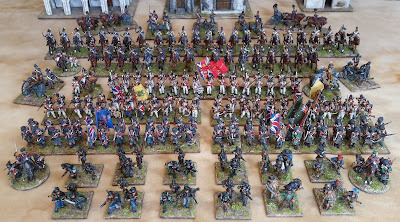 Although at next Saturdays game, I plan to only use 4 figures per unit, as the tables are only 5x6' and I am allowing up to 6 players! 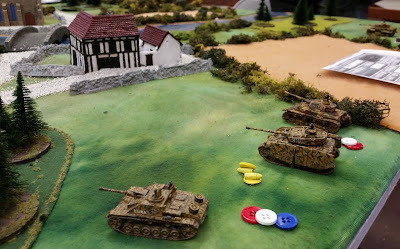 There are no immediate plans for additional units, except for maybe a couple of French Horse Artillery - just to balance out the two RHA units the British have already. 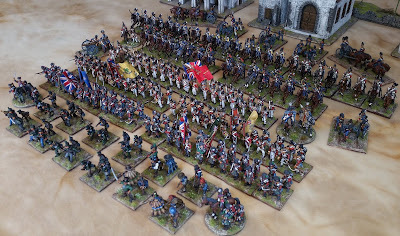 I plan on hosting a few Black Powder games at next year's Enfilade!, which has larger tables - 12x6'. 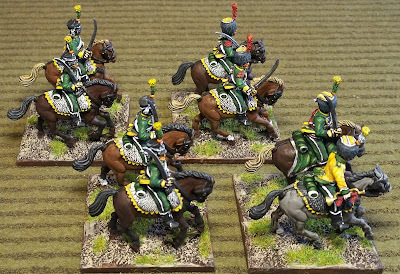 Actually, a French Lancer unit (or two) may be added down the road - either Polish, Dutch or even Berg in their flashy green and pink uniform. 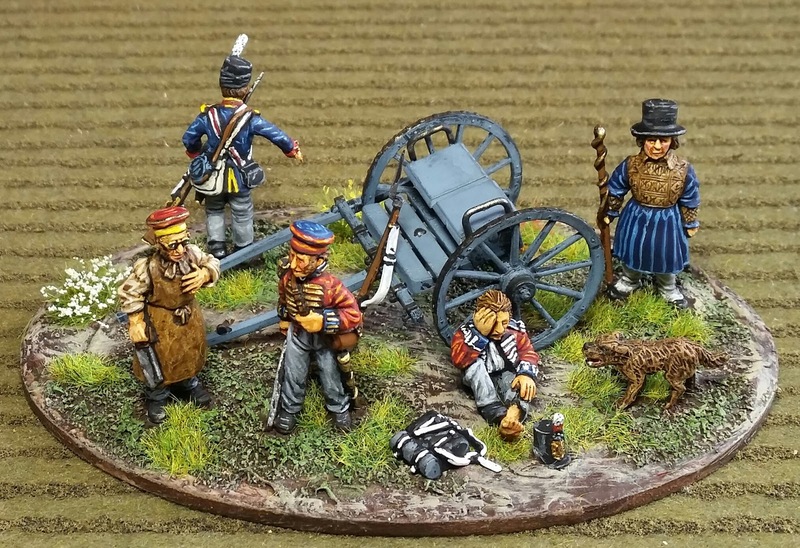 But those other units will have to wait, as I now need to settle on the scenario for next week's game - I'll likely use one of the ones the Black Powder Peninsular supplement. Thanks for stopping by and wishing you all the very best! I really should be finishing up the last unit of cavalry - British Light Dragoons, no less. 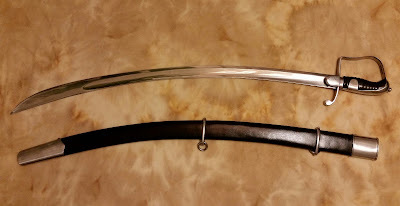 However, a reproduction Pattern 1786 Light Cavalry Sabre made by Cold Steel arrived on my doorstep today. 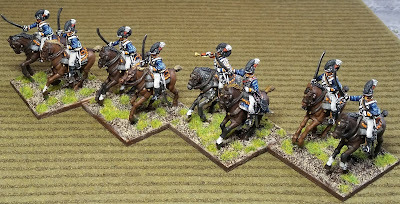 The sword was designed with the help of the great British cavalry commander, General Le Marchant after his experience in the Flanders Campaign as a young officer. 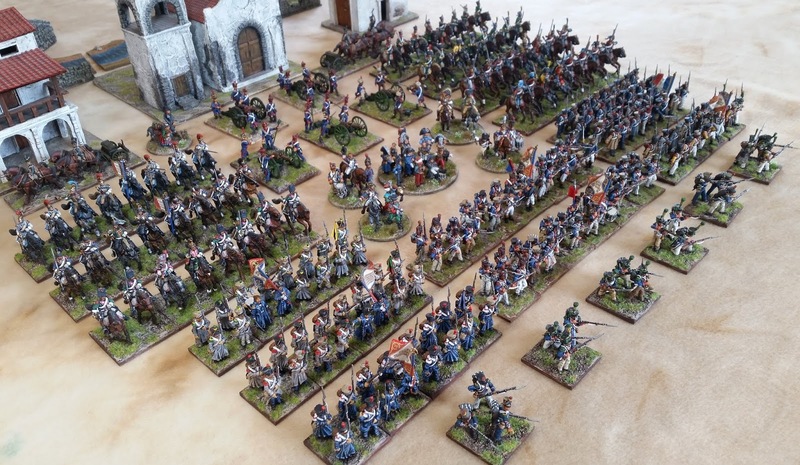 Who said you need a big table or Black Powder? 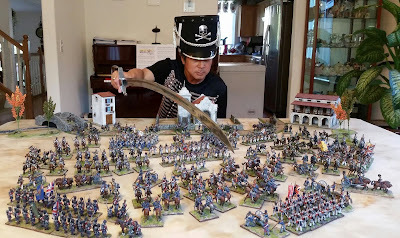 Actually, just a photo op, but the 5x6' table will help me decide on what units to use at the game day next Saturday at Fort Steilacoom. An all-metal scabbard would've been more authentic, but the vendor I ordered this from didn't carry those anymore. Well, thank you for allowing me to indulge myself (yet again). 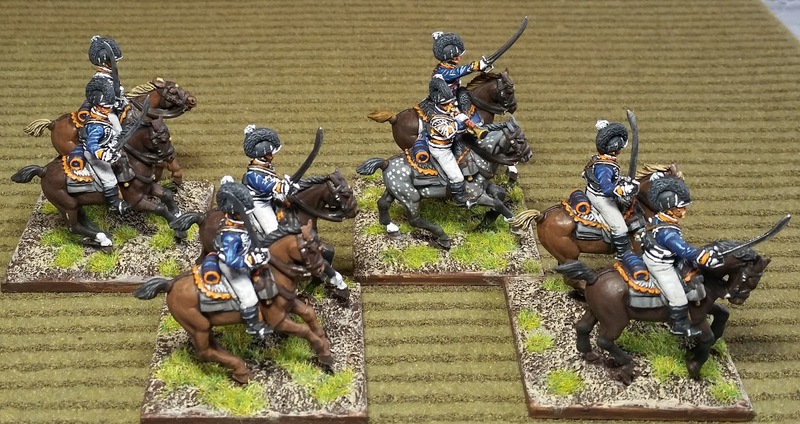 Kindest regards to you all; and the next post should be the completed Light Dragoon (wielding the Pattern 1796). 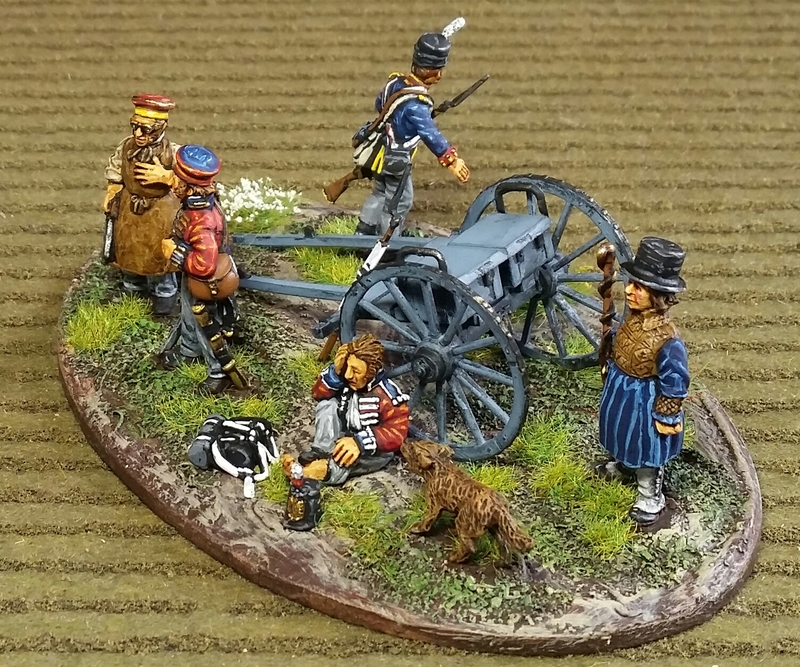 Here's the second Chasseur a Cheval unit from the Perry plastic set - with an additional command sprue. They have yellow facings which were worn, with slight cuff and collar variations, by 4th, 5th and 6th Regiments. The 5th served extensively in the Peninsula, including the Battles of Vitoria and Toulouse. The 4th and 6th participated in the Russian Campaign, as well as the Battles of Leipzig and Waterloo. They are in full-dress uniforms with colpacks and uncovered shakos. 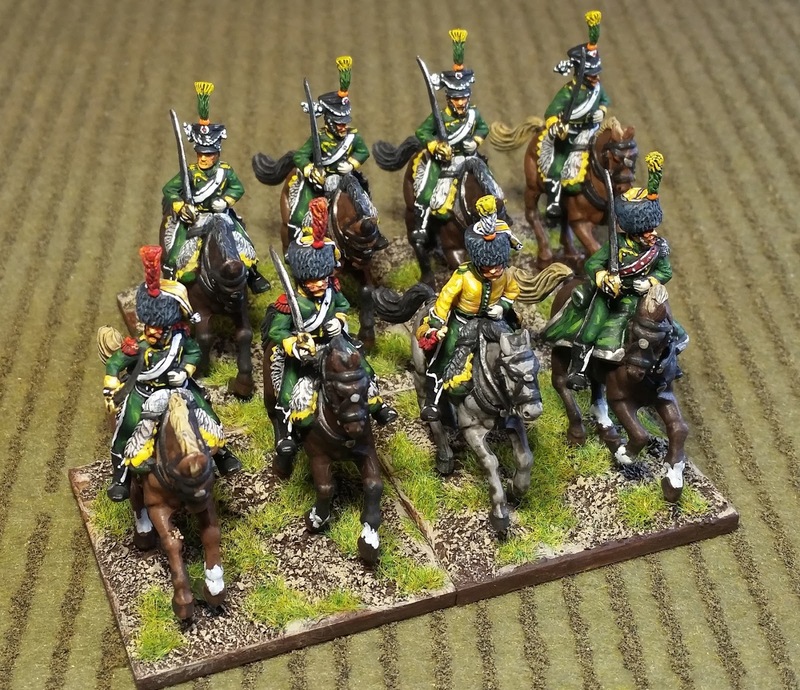 The green is a bit darker than the previous chasseur unit's. I mixed a bit more Vallejo Dark Prussian Blue to the Flat Green. 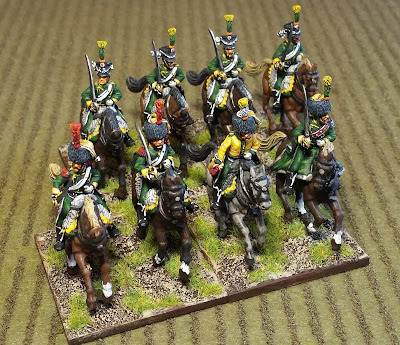 Carbines have been left off of these, as well as the Spanish Dragoons and the other Chasseur unit. As these are intended mainly for gaming, the carbines can be popped off by routine handling. 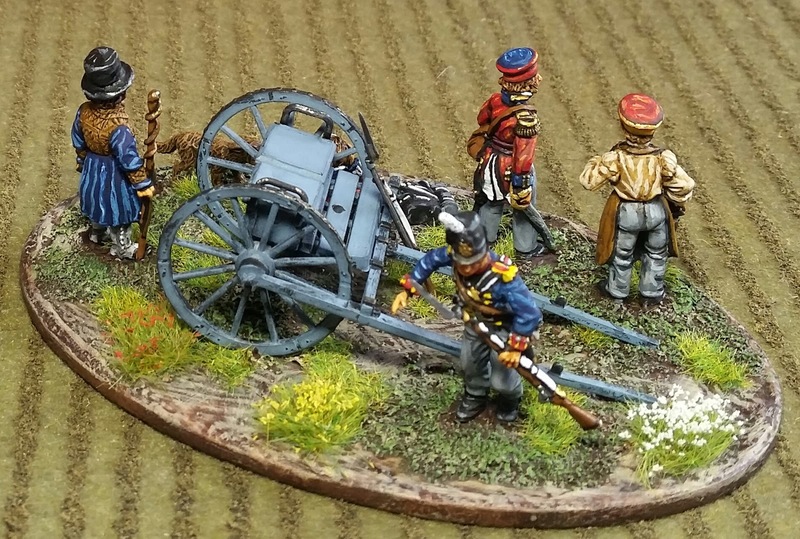 These guys will also be used in a small Black Power game in a few weeks at a game day. 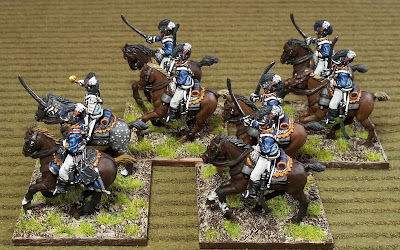 It'll be interesting to see how they perform as the last time I played Black Powder, I only had a few cavalry and didn't really focus on their use. 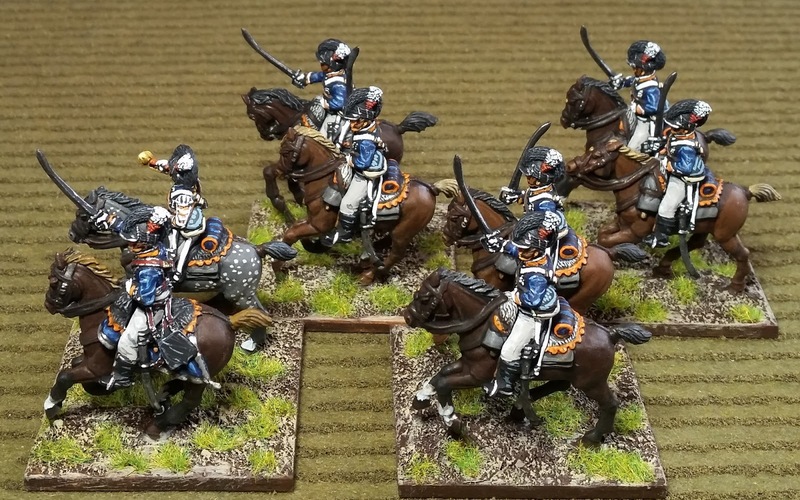 I foresee them in action mostly against opposing cavalry. Charging infantry isn't really advisable for the rules. 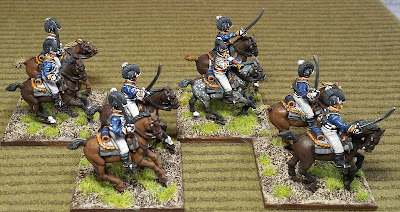 Even if they are able to charge into Disordered or Shaken Squares, they get no charge bonus, and the Square still gets the +3 bonus against cavalry combat result. Although, you never know with players. Next up are the British Light Dragoons - hope to have them done for the game day as well. Well, so much for now and best wishes to you all on this fine Labor Day (holiday for us in the US). 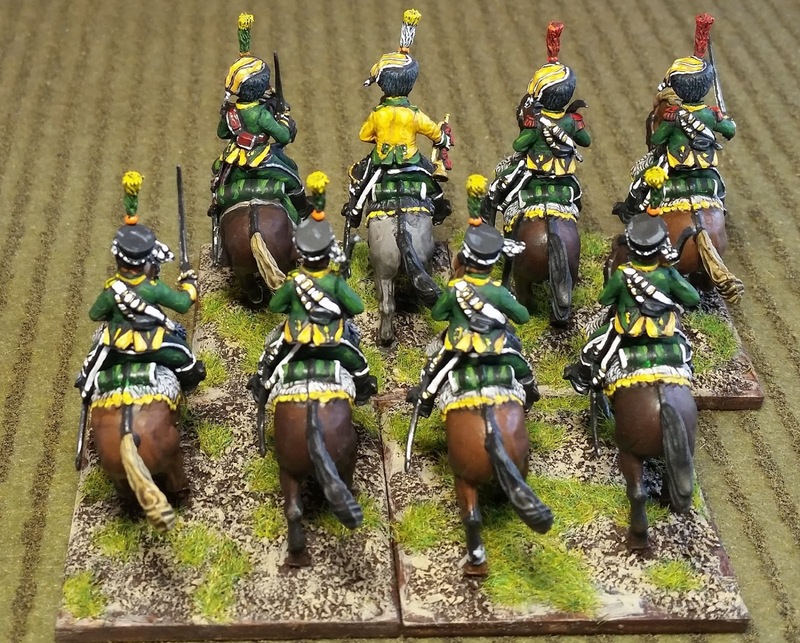 Another unit of plastic Perry cavalry. Again, these are in an 8-figure unit which should facilitate troop movement on smaller tables. With slight variations to collars and cuffs (as well as shades), orange facings were used for the 13th, 14th, 15th, 19th, 20th, 21st, 22nd, 23rd and 24th. Most of these regiments served in the Peninsula. They originally were going to have sky-blue facings, but I switched to orange as it contrasts the green better, IMO. I need to get a pair of metal studded trousers; they are way cool. Another unit each of French Chasseurs and British Dragoons are next in the painting queue. 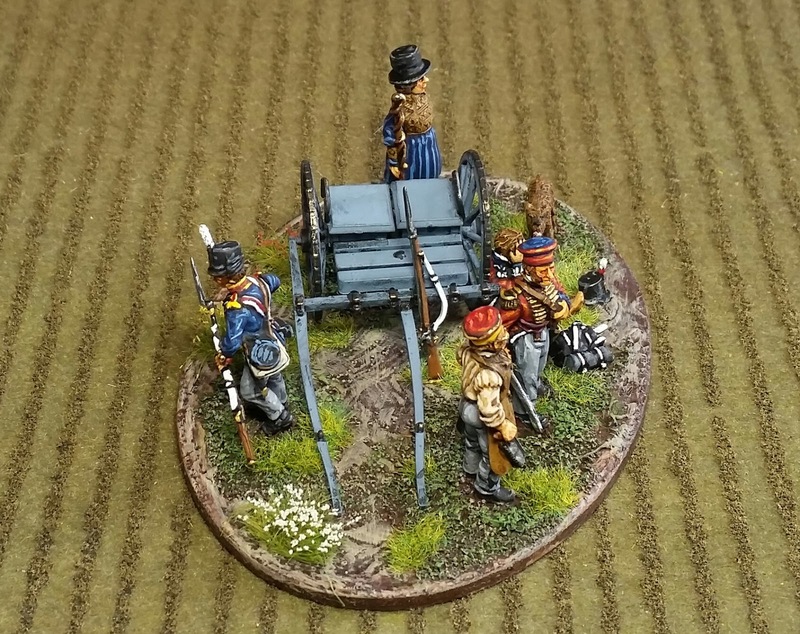 I have committed to hosting a small Black Powder game in a couple of weeks at a game day. 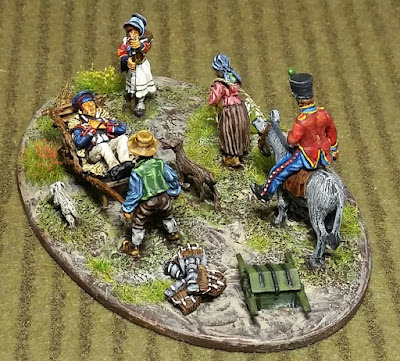 I say small because the tables are only 5x6' and hope to have 6 players. Yes, quite tight for the rules, but I've reduced the movement and ranges by a third, as well as reducing figures per unit. So much for now; thanks again for stopping by, and best regards to you all!